The Avan Motorhome collection delivers the ultimate travel experience. Whether you are travelling around the state or around the country, your Avan motorhome ensures a smooth drive and luxurious living accommodation. Style, functionality and all the luxuries you would expect in your home away from home have been carefully considered in the design of both the Ovation & Applause range of Motorhomes. Avan’s innovative sub-floor construction method enables safer and more efficient housing of the motorhome’s electrical and plumbing assemblies, allowing more space and storage options in the main cabin. The Ovation & Applause Motorhomes come with more quality features than any other motorhome in their class. Put simply, value is standard, not an option. Every Avan Motorhome features double-glazed and tinted windows, combined with all-round insulation and roof-mounted air-conditioning for maximum comfort in all climate conditions. Total amenity is assured with full en-suite including separate shower, toilet & vanity unit. What’s more, our heavy duty battery pack & charger allows extra days of camping in remote places without the need for external power. 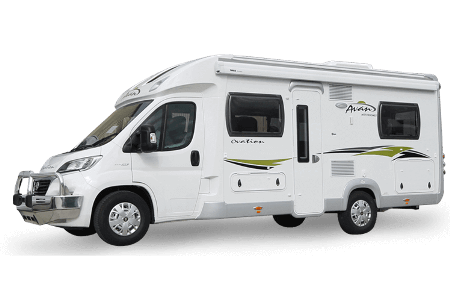 Along with a hot water service & electric water pump, plus so many other quality standard features, an Avan Motorhome is your invitation to genuine ‘5 Star’ affordable travel. Looking to buy a new motorhome? Give Avan a try!